Nintendo’s new WiiT video game system not only changes how people play games, but redefines how they interact with both the system and their televisions. With the Wii Menu, Nintendo offers a gateway to new experiences through a collection of interactive channels people can use to customize their gaming and entertainment options. The Wii Menu serves as the main portal to the different functions of Wii, and is designed to evolve throughout the life of the system. Some functions can be used right out of the box and more will roll out during the next few weeks and into next year, with content continually changing over time. Wii goes on sale in the Americas Nov. 19 at an MSRP of $249.99. 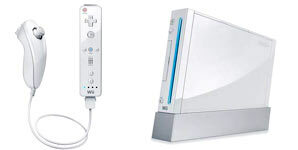 On launch day, players who want to play a Wii game or a Nintendo GameCubeT game simply pop in the disc, aim their motion-sensitive Wii RemoteT at the Wii Menu and click on the Disc Channel to start the game. It’s that simple. But some of the real fun with the Wii Menu comes with customization. The MiiT Channel lets users create caricatures of themselves (or anyone else) that can be used first in Wii SportsT, a collection of five sports games packed in with the Wii system. Up to 10 Mii characters can be stored in a single Wii Remote, and players can carry them to a friend’s house and populate multiple Wii systems. Using the Photo Channel, users can explore their creative talents by developing a slide show or showing off their best shots in an easy, fun way. With an SD memory card from a digital camera, users can display their photos on their televisions and perform basic editing and manipulation. The Wii Shop Channel serves as Wii’s online storefront, where visitors can redeem Wii PointsT to download games or other items. Users need a high-speed Internet connection to access the Wii Shop Channel and choose from at least 12 classic Virtual ConsoleT games that will be ready to play on launch day. Some of the games a player can download include: Donkey Kongr (NESr), based on the arcade game of the same name; SimCityr (SNEST), where players get to build a city from the ground up, being responsible for each decision they make; Super Mario 64r, the first-ever true 3-D game, which changed the face of gaming forever; Sonic the Hedgehogr (Genesisr), the fastest blue hedgehog on Earth whips through hair-raising loop-de-loops and into dizzying dives; and Bombermanr ’93 (TurboGrafx16T), the exciting, powered-up version that followed the original Bombermanr. More Virtual Console games will become available weekly every Monday following launch and by year’s end, gamers will be able to pick from a library of 30 or more classic games from the Nintendo Entertainment Systemr, Super NESr, Nintendor 64, Sega GenesisT and TurboGrafx16 consoles. Users buy Wii Points at retail or with a credit card in the Wii Shop Channel and redeem their Wii Points to download the classic games. NES games start at 500 Wii Points, Super NES games start at 800 Wii Points and Nintendo 64 games start at 1,000 Wii Points. Sega Genesis games start at 800 Wii Points and TurboGrafx16 games start at 600 Wii Points. The Wii Shop Channel is also where users will go to download the Opera browser that will let them surf the Internet from the comfort of their couches on Wii’s Internet Channel. More information about the availability of the browser will be released in the coming weeks. On Dec. 20, Nintendo will roll out the Forecast Channel. Users will be able to access free local weather information, which is continually updated. Users can access worldwide weather information by browsing a 3-D globe. Weather information will be supplied by Weathernews. A high-speed Internet connection is required to access the Forecast Channel. Then on Jan. 27, the Wii Menu News Channel will make headlines with the latest news from around the world provided by the Associated Press. A high-speed Internet connection is also needed to access the News Channel. Next articleWhich Film Will Win The 2018 Best Picture Oscar Statue?